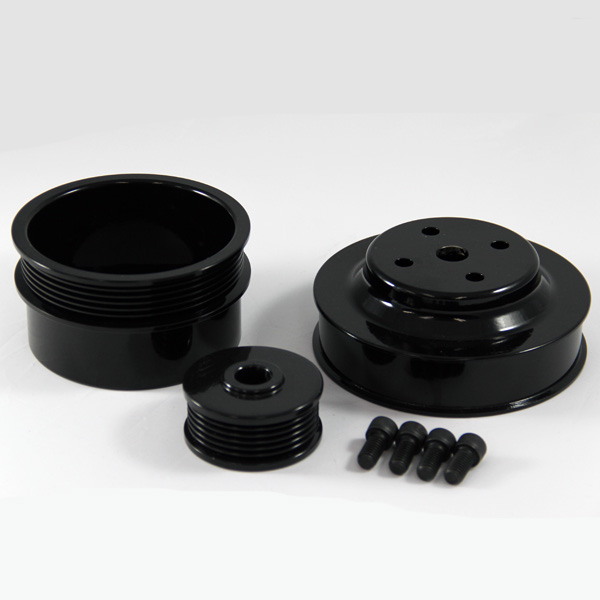 * Black Powder Coated Finish One of the first and still most popular bolt on for the 5.0L Mustang. These pulleys increase the power of your car by slowing down your power robbing accessories (water pump and alternator). Typical gains from this pulley set is 15 Horsepower. Quality Construction: Machined from Billet Aluminum. No one else gives you the bold clean styling of our Aftermarket Dress Ups, Suspension and Performance Parts for your American Muscle Car like UPR Products! Installs in 45 minutes or less. Includes all necessary hardware. Fits these Vehicles: 1979 1980 1981 1982 1983 1984 1985 1986 1987 1988 1989 1990 1991 1992 1993 V8 GT Cobra Mustang Roush & Saleen Vehicles. Made in the USA!